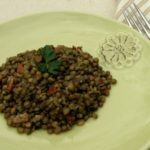 A delicious homemade side dish made with French green lentils, bacon, fresh herbs, and a red wine vinaigrette. Pick over the lentils, rinse and drain. In a large 6 quart pot, place the lentils, onion, garlic, bay leaf, salt, and pork. Add water and cover the ingredients by 2 to 3 inches. Bring to a boil over high heat. Reduce heat to low, cover, and simmer until the lentils are tender (about 20 to 25 minutes). Do not over-cook lentils or they will be mushy. Drain lentils and discard the onion, garlic, bay leaf, and salt pork. Stir in pepper. In a large bowl, whisk together the vinegar, olive oil, mustard, salt, pepper, parsley, thyme, rosemary, and basil. Add the lentils and bacon to the dressing. Stir to combine. Serve warm or at room temperature.